(2007). Undernourishment Around the World 2010. FAO. Retrieved November 29, 2010, from http://www.fao.org/docrep/013/i1683e/i1683e02.pdf. African Development Bank. (2010). Infrastructure - African Development Bank. Retrieved November 29, 2010, from http://www.afdb.org/en/topics-sectors/sectors/infrastructure/. Anderson, Mary B. (1999). Do no harm: how aid can support peace - or war. Boulder: Lynne Rienner Publishers. Awasthi, S., Peto, R., Pande, V. K., Fletcher, R. H., Read, S., & Bundy, D. A. P. (2008). Effects of Deworming on Malnourished Preschool Children in India: An Open-Labelled, Cluster-Randomized Trial. Public Library of Science. Banerjee, Abhijit. (2007). Making Aid Work. Cambridge: MIT Press. Barg. (1992). FAO Fisheries Technical Report. Blanton et al. (1987). Journal of Marine Research: 497-511. Boynton et al. (1985). Marine Ecology Progress Series 23: 45 -55. Burchi, F. (2006) Education, Human Development, and Food Security in Rural Areas: Assessing Casualties. Burchi, F., & De Muro, P. (2007). Education for rural people: a neglected key to food security. Rep. Universita Degla Studi Roma Tre. Cherry, B. (Janurary 18, 2010). GM Crops Increase Herbicide Use in the United States. Institute of Science and Technology. Retrieved November 10, 2010, from http://www.i-sis.org.uk/GMcropsIncreasedHerbicide.php. Chopin et al. (2004). Integrated aquaculture: rationale, evolution and state of the art emphasizing seaweed biofiltration in modern mariculture. Aquaculture 231: 361-391. Collier, P. (2008). The Politics of Hunger: How Illusion and Greed Fan the Food Crisis. Foreign Affairs, 87, 67-79. Cribb, Julian. (2010). The Coming Famine: The Global Food Crisis and What We Can Do to Avoid It. Los Angeles: University Of California Press. Deichmann, U., Buys, P., & Wheeler, D. World Bank, Development Research Group. (2006). Road network upgrading and overland trade expansion in Sub-Saharan Africa. Dregne, H.E. (1976). Developments in Soil Science. New York, NY: Elsevier Scientific Publishing Company. Easterly, W. (2006). The White Man’s Burden. New York: Penguin Books. Easterly, W. The Elusive Quest for Growth: Economists' Adventures and Misadventures in the Tropics. Cambridge, MA: MIT, 2001. Enolar is a site that presents technical information and detailed prices of solar dryers (http://www.enolar.com/products03.htm). Feder, G., Lawrence, L. J., & Slade, R. H. (1987). Does agricultural extension pay? The training and visit system in northwest India. American Journal of Agricultural Economics, 69(3), 677-686. Flides, J. (2009, July 23). The winds of change for Africa. BBC News. Retrieved November 29, 2010, from http://news.bbc.co.uk/2/hi/technology/8165262.stm. Full Belly Project. (2010). What We Do. Retrieved November 19, 2010, from http://www.thefullbellyproject.org/index.php?option=com_content&view=article&id=73&Itemid=87. Gawande, Atul. (2007). Better: A Surgeon's Note on Performance. New York: Metropolitan Books. General Assembly of the United Nations. (1948). Universal Declaration of Human Rights. Retrieved December 1, 2010, from http://www.un.org/en/documents/udhr/index.shtml. Glendinning, A., Mahapatra, A., & Mitchell, C.P. (2001). Modes of communication and effectiveness of agroforestry extension in eastern India. Human Ecology, 29(3), 283-305. Grebmer, Klaus, et. Al. (2009). 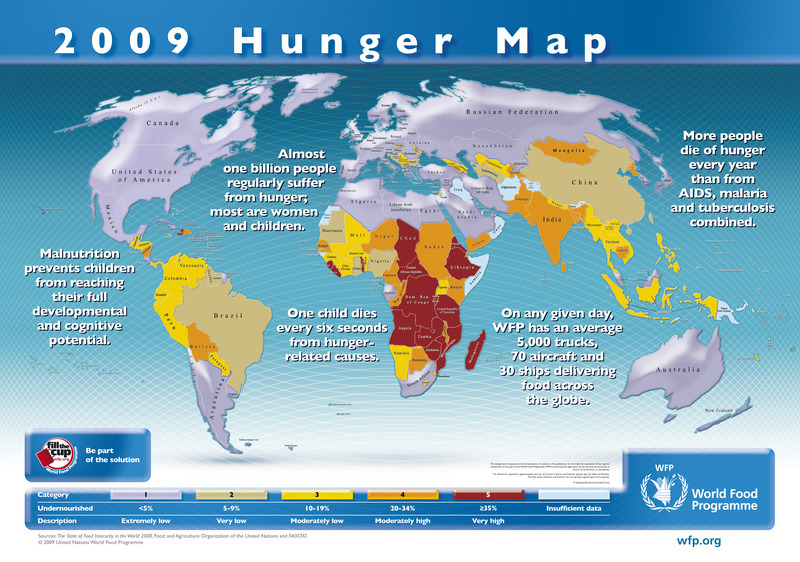 2009 Global hunger index. Washington, D.C.: International Food Policy Research Institute. Hartill, L. (2010). Lettuce: The green gold of Niger. Catholic Relief Services. Hartwich, F. J.-A. (2007). Building Public-Private Partnerships for Agricultural Innovation. Food Security in Practice technical guide series. Washington, D.C.: IFPRI. "Helping Haiti." (2009) Solar Cookers International. Retrieved November 23, 2010 from http://www.solarcookers.org/. Hemminga et al. (1991). Marine Ecology Progress Series 71: 85-96. Horton, S., et al. (2010). Scaling Up Nutrition: What Will It Cost? Washington, D.C: The World Bank. IFPRI. (2010). Fighting the Crisis of Early Childhood Undernutrition. Global Hunger Index, 21-29. IFPRI. (2010). Global Hunger Index: The Challenge of Hunger: Focus on the Crisis of Child Undernutrition. Washington, D.C.: IFPRI. International Food Policy Research Institute. Global Hunger Index - 2009: The Challenge of Hunger: Focus on Financial Crisis and Gender Inequality, 21-23. Gender Inequality and Hunger. Jamison, E. A., Jamison, D. T., & Hanushek, E.A. (2006). The effects of education quality on income growth and mortality decline. Available from National Bureau of Economic Research. (Working paper no. 12652). Key, N., Roberts, M. J., O'Donoghue, E. (2006). Risk and farm operator labour supply. Applied Economics, 38, 573-586. King, K. (1991). Aid and Education in the Developing World. Essex: Longman Group. Kirk, J., & Winthrop, R. (2006). Meeting EFA: Afghanistan home-based schools. Kiva is a site that presents the details of the Kiva program, a microfinance program aims to relieve poverty in developing countries (http://www.kiva.org/). Krom, M. D. & Neori, A. (1989). A total nutrient budget for an experimental intensive fishpond with circularly moving seawater. Aquaculture 88: 345-358. Krom, M. D., Porter, C. & Gordin, H. (1985). Causes of fish mortalities in the semi-intensively operated seawater ponds in Eilat, Israel. Aquaculture 49: 159-177. Latham, M. C. (2007). Global action against worm infections, measles, and malaria. Ithaca: Cornell University. Lipton, M. (1996). Successes in anti-poverty. Available from International Labour Office (Discussion paper). Lopez-Claros, A. (2005). Women’s Empowerment: Measuring the Global Gender Gap. World Economic Forum. Retrieved November 29, 2010, from http://www.weforum.org/pdf/Global_Competitiveness_Reports/Reports/gender_gap.pdf. Markham, D. Harnessing the wind with junk: Malawian wind inventor William Kamkwamba. Green Living Ideas. Retrieved November 22, 2010 from http://greenlivingideas.com/topics/alternative-energy/wind-energy/harnessing-wind-junk-malawian-wind-inventor-william-kamkwamba. Mbogo, S. (2010, March 31). Small scale farmers in Kenya increasingly look to outgrowers’ contracts. Retrieved November 22, 2010, from http://www.africanagricultureblog.com/2010/03/small-scale-farmers-in-kenya.html. McNeely, J. A., & Norgaard, R. B. (1992). Developed country policies and biological diversity in developing countries. Agriculture, Ecosystems & Environment, 42(1-2), 194-204. Meikle, Amber and Rubin, Vanessa. (2008). Paying the Price of Inaction. London: Care International. Retrieved November 29, 2010, from http://www.careinternational.org.uk/attachments/078_Living-on-the-Edge-Paying-the-price-of-inaction.pdf. Moyer, Melinda Wenner. (December 2010). A Killer Water Filter. Scientific American, 303(48). Mya, T. (1998). Development Strategies, Agicultural Policies and Agricultural Development in Southeast Asia. ASEAN Economic Bulletin, 55(1), 1-12. Narayan, D. (2002). Employment and poverty reduction: a sourcebook. World Bank. Narrod, C; Roy, D.; Okello, J.; Avendaño, B; & Rich, K. (2007) The role of PPPs and collective action in ensuring smallholder participation in high value fruit and vegetable supply chains. IFPRI. Nissanke, M. (2003). Revenue Potential of the Currency Transaction Tax for Development Finance: A Critical Appraisal. Retrieved November 29, 2010, from EconLit database. Parry, Martin, Alex Evans, Mark W. Rosegrant and Tim Wheeler. (2009) Climate change and hunger: Responding to the Challenge. World Food Programme. Paxse. (2008, December 21). Long grain rice Bakan [picture]. Bakan, Cambodia. Retrieved November 24, 2010 from http://commons.wikimedia.org/wiki/File:Long_grain_rice_Bakan.JPG. Pelletier, D. et al. (1994). A methodology for estimating the contribution of malnutrition to child mortality in developing countries. The Journal of Nutrition, 2106S-2122S. Phipps, R. H., Park, J. R. (2002). Environmental benefits of genetically modified crops: Global and European perspectives on their ability to reduce pesticide use. Journal of Animal andFeed Sciences. p 1-18. Pimentel, David., Raven, Peter. (2000, July 18). Bt Corn Pollen Impacts on Nontarget Lepidoptera: Assessment of Effects in Nature. Proceedings of the National Academy of Sciences. 97(15). p 8198-8199. Rawson et al. (2002). Interaction of Extraction and Fed Aquaculture: 265-295. Rosegrant, M. & Cline, S. (2003). Global food security: Challenges and policies. Science, 1917-1919. Samman, E. and Maria Emma Santos. (2009). Agency and Empowerment: Review of Concepts, Indicators, and Empirical evidence. Oxford Poverty and Human Development Initiative. Schwille, J. & Wheeler, C. (1991). Primary education in Thailand. In H. J. Walberg (Ed. ), International Journal of Educational Research (pp.123-226). Oxford: Pergamon Press. Shpigel, M., Lee, J., Soohoo, B., Fridman, R. & Gordin, H. (1993). Aquaculture & Fisheries Management 24: 529-543. The Transportation System in Cambodia. (2010). Retrieved November 29, 2010, from http://www.asianinfo.org/asianinfo/cambodia/pro-transportation.htm. UNICEF and WHO. (2009). Baby-friendly hospital initiative. New York: Nutrition Section-Programme Division UNICEF. Von Braun, J., Ahmed, A., Asenso-Okyere, K., Fan, S., Gulati, A., Hoddinott, J., von Grebmer, K. (2008). High Food Prices: The What, Who, and How of Proposed Policy Actions. Washington D.C.: International Food Policy Research Institute. World Bank. (2005). Implementation Completion Report (IDA-28120 PPFI-P8890) on a Credit in the Amount of SDR 34.0 Million to the Republic of Kenya for a Nairobi – Mombasa Road Rehabilitation Project. Document of the World Bank.